This is one simple and userful module. 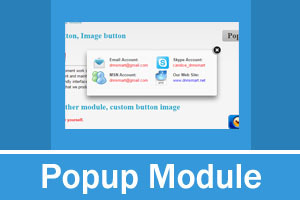 Its main function is that it would popup one window after you click one button or one image in the module. You can adjust module template in the back-end, you can put HTML or one third-party module in the popup window. Text button and image button, click it. You can custom module template by yourself.